Strawberry season is in full swing and today I’m sharing a fantastic Strawberry Buttercream Frosting Recipe that is easy to make, pipes beautifully, and is bursting with strawberry flavor! 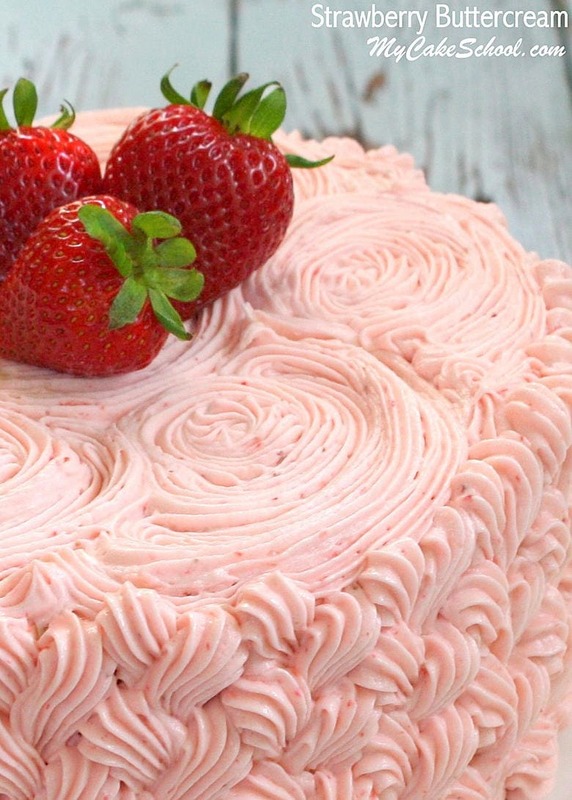 This versatile strawberry buttercream recipe can be used as a filling or frosting, and tastes AMAZING with all sorts of cake and cupcake flavors. 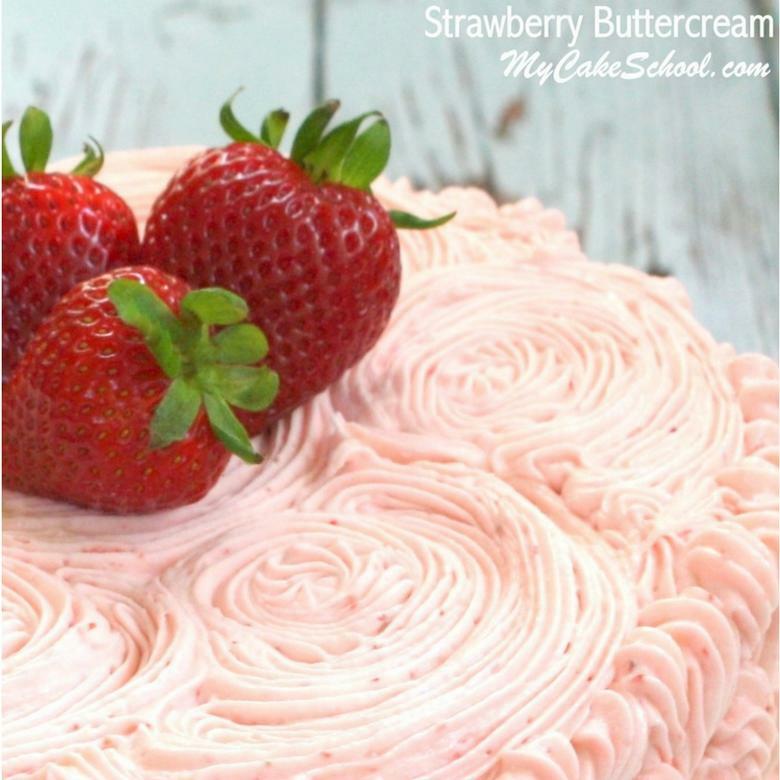 We have quite a few favorite buttercream recipes in our Recipes section, and this latest strawberry addition does not disappoint! Not only is it the perfect complement to Strawberry Cake, but it is divine with white, yellow, chocolate, and even lemon cakes and cupcakes! In fact, Strawberry Lemon Cake is a brand new favorite of mine! Most of the strawberry flavor in this buttercream recipe comes from pureed fresh strawberries. However, if you’d like a bit of a strawberry flavor boost, you can incorporate a touch of strawberry extract. 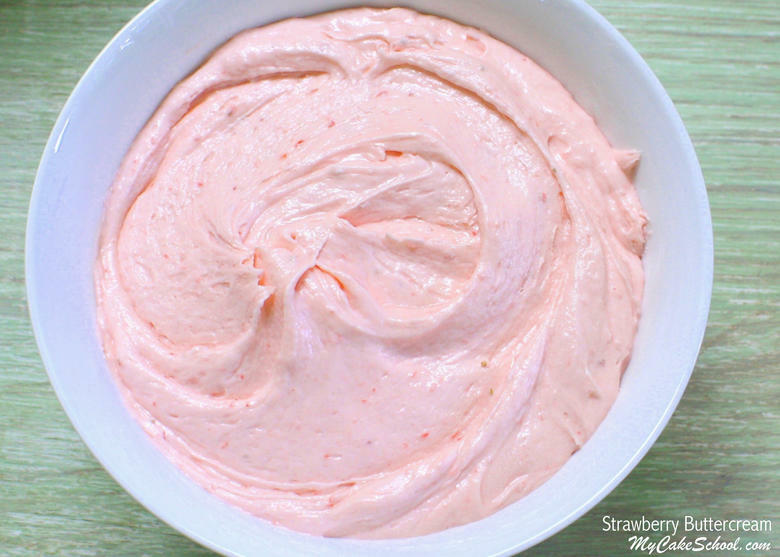 This is such a flavorful frosting, and is a MUST for spring and summertime recipes! It pipes perfectly too! Cream the softened butter until smooth. Gradually add the powdered sugar and pureed strawberries beating at medium speed until blended. Slow down the mixer to very slow (#2 on a KitchenAid) and mixing another 1 to 2 minutes. This will eliminate air pockets. The buttercream will become very smooth. If the buttercream is too thin add more powdered sugar, if too thick add more puree or a bit of milk. Thanks for stopping by! Make sure to check out more of our FAVORITE cake and frosting recipes in our Recipes section! Hi Claudia, I’m glad you asked the question, the butter flavoring slipped my mind. When eliminating all the butter you will need to add that flavor. I think based on the quantity of the strawberry recipe I would add 1/4 teaspoon butter flavoring . I would leave out the almond and use only the strawberry extract. I would use 1 teaspoon strawberry extract unless after tasting the buttercream you think it needs a bit more. The high ratio shortening has no flavor so you might need to adjust the amounts of butter flavor or strawberry extract to suit your taste. If you were open to using some butter, you could change the recipe to 1/2 cup (1 stick ) butter and 1/2 cup high ratio shortening, eliminate the butter flavoring and keeping the recipe otherwise the same except you might need to add a bit more liquid (strawberry puree or milk) as I mentioned earlier. Let me know if you have other questions. I opened my small bottle of Strawberry Extract but before using I tasted of it…. so bitter and an after taste… I didn’t use it… it wasn’t good!! Not sure what brand you use but this one I ordered from a great company was not good.., I poured it down the drain!! So I bought fresh strawberries and made a strawberry syrup to use… haven’t used it yet… But it taste wonderful!! This frosting is absolutely, deliciously, spectacular!! I think it tastes even better the day after you make it and the strawberries have time to sit. I didn’t use any flavorings or extracts with it and it is so fresh tasting and womderful…especially on your white cake recipe! Yummmm!! I have 3/4 a of a cup of strawberry puree, left over from another recipe. I would like to make this recipe, but I don’t know how much 10-12 large strawberries would be. How much purée would I need? Also, can I freeze this? A friend picked chocolate cake with strawberry frosting for a belated birthday cake. I might be having surgery, and want to get a lot done before then. Also, which dark chocolate cake would you recommend with this frosting? Hi Judy, You have enough strawberry puree with 3/4 of cup. The recipe needs 1/4 cup plus 1 Tablespoon, more if needed to reach the spreading consistency your like. You could always add a bit of milk if needed. We most often use the Classic Chocolate Cake recipe. I think you would also like the Chocolate Sour Cream or Devils Food recipe. These two are a bit darker. All would pair well with strawberry frosting. The cake layers can be made in advance and frozen for up to 2 months, just wrap layers individually in plastic wrap and then in aluminum foil. Hope all goes well. Thanks so much for getting back to me so quickly. What’s confusing me is that the recipe says it needs 10-12 strawberries that are puréed. And then it says 1/4 cup plus 1 TBSP. Is this an error in the recipe??? Hi Judy, I think I understand your question now. The 10-12 strawberries are pureed to give you the 1/4 cup plus 1 TBSP. The 10 to 12 strawberries will give you more than than 1/4 cup. If your strawberries are very small you can add a few more to the blender. Does this help? Yes, thank you. I understand now. I didn’t know why the strawberries were listed in two places. I will make the frosting and freeze it. Hi, Will this frost a half sheet single layer cake or would I need to increase? Thank you.